Imagine you wake up one day in some alternate universe and you feel like you’re the only person who remembers the way things used to be. Life will never be the same and, yet, it seems everyone else is still back there in that place you once were. Loss is inevitable. Expressions of sympathy and advice such as “time heals all wounds” may come with the best intentions but often have little effect on the pain you feel when you’re in the midst of loss. I answer the heroic question “Death, where is thy sting?” with it is here in my heart and mind and memories. That sting can often be eased by a willing ear. “Grief never ends…but it changes. It’s a passage, not a place to stay. Grief is not a sign of weakness, nor a lack of faith…it is the price of love.” — author unknown. The Schorman Center operates under the umbrella of Hospice in order to provide bereavement services, according to Lisa To, executive director of Hospice of Warren County. “We offer free grief counseling to children and adults who have experienced death,” To said. Fran Leto, grief counselor at the center, explained the role she and others play in helping people dealing with loss. “A grief counselor is someone who provides a safe and nurturing space for all you are feeling and dealing with, someone who walks beside you with understanding and encouragement, who can offer ideas that others have found helpful on their journey, and who honors wherever you are in the process, knowing that your timetable is determined by you — and you alone,” she said. Interviewer: What brought you to grief counseling with The Schorman Center? Client: After my husband’s death, I found that I wasn’t doing very well emotionally. My family was very supportive and wanted me to “be okay.” However, when I overheard one of my relatives talking to another family member, commenting on how well I was doing, I realized they really didn’t understand my struggle. I knew then that I needed to find someone who understood grief and how I was really feeling. I went to my church to seek out information regarding grief support and I was given the contact information for Hospice of Warren County/ The Schorman Center. I ended up seeing an individual grief counselor with them and also attended the 4 week Grief Support Workshop. Interviewer: What was the counseling process like for you? Client: My counselor understood exactly what I was feeling and allowed me to talk about my husband for an hour or whatever I needed to talk about. I also felt comfortable to cry – which I did for one session – she helped me to know that was okay and normal. My family wanted me to be “happy” and move forward, but I just couldn’t at that time. I met with my grief counselor about 5 or 6 times before I felt that I was okay to try to deal with everything on my own. The Grief Workshop experience where I met others who had lost their spouses gave me the opportunity to bond with their experiences which were much like my own. The weekly sessions provided information and support that equipped me with new coping skills and understanding on how to build my “new normal” life. For me, both types of grief support were very helpful. Interviewer: What would you say to people who suspect they may need grief counseling, but are afraid or unsure about reaching out? Client: “Don’t hesitate – make the call – you won’t be sorry!” Don’t be afraid of what your family or friends may think. You have to do what’s best for you. Interviewer: In what specific ways did grief counseling ease your burden and make your daily life more functional? Client: The individual grief counseling and group experience helped me to feel normal and reassured me that my grief was my own and that whatever time it took I would be okay. I made lasting friendships with the group and the Hospice of Warren County grief support staff. Client: I would absolutely recommend meeting with the Hospice of Warren County/ Schorman Center grief staff for either individual or group support or both. One more thing I would say is the comfort I have had from a quote on one of the Schorman Center brochures. “Grief is not a sign of weakness, nor a lack of faith. It is the price we pay for love,” has helped me so much. Interviewer: What brought you to grief counseling with Hospice of Warren County/Schorman Center? Client: My family and I lived out of state. When my husband died, I moved with my children to Warren to be near my parents. My father had seen an ad for Camp Forget Me Not and encouraged me to call Hospice of Warren County to register my children for the grief camp. In the process of helping them, I ended up meeting with one of the grief counselors myself. Client: My counseling experience was helpful because I could talk openly and not feel judged. Because my counselor had also experienced the death of her husband, I felt that she really connected with what I was going through. As for my children, Camp Forget Me Not helped them to talk through their feelings. They gained some really good coping skills. They attended for two years as we had had a second family death. Sadly, once again we have a loved one who may pass by August and so they will attend again this year. Each year at camp they have both gained new understanding of how to deal with death in the present, but also to help them face future losses. Interviewer: What would you say to others who suspect they may need some grief counseling, but are afraid or unsure of reaching out? Client: I would say they should set aside their comfort zone. Going through this experience on your own is too much. Talking with a grief counselor helped me to know that everything I was feeling was okay and it also helped me to honestly connect to my feelings of anger when I felt that way. You shouldn’t feel guilty about the anger you may feel. You have to feel these things in order to get past them to your new normal way of life. Interviewer: Is there anything else you want to ad? Client: For me, having someone to take my children to was so helpful! Sometimes they would not want to talk to me because they thought it would make me sad. Knowing they can talk about things they need to talk about with someone other than me was good for all of us. My daughter really enjoyed the memory crafts at Camp Forget Me Not. Both children still sleep with the pillows they made with a happy side of memories and sad side of memories on the pillowcase. My son really benefited from Camp Forget Me Not’s Counselor Corner time. He feels that they really cared and listened to what he wanted to talk about. I would highly recommend others to consider both individual grief counseling and if children are involved send them to the grief camp. My children continued (after camp) to see the grief counselors at school. Having the continuity of this support between the grief camp and school has been very helpful. 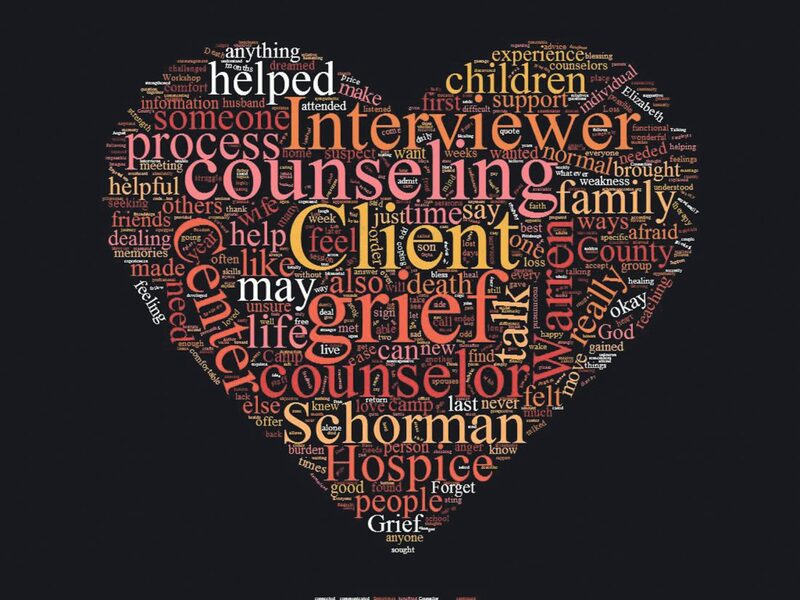 Client: Following the sudden death of my son, my employer and wife encouraged me to seek out grief counseling with Hospice of Warren County’s Schorman Center. Client: The process was extremely helpful. It felt like “home.” I felt that I could say anything to my grief counselor and her dog. I was surprised at the ease with which we communicated on many topics. My wife also attended the sessions with me and together we actively were strengthened as a couple in our marriage. Interviewer: What would you say to people who suspect they may need some grief counseling, but are afraid or unsure about reaching out? Client: People need to be open to this kind of therapy. It was the best therapy I ever had in my life. It is huge that this help was free. Also, it is good to talk with people who are not family – good to have a totally objective person to listen, give feedback, advice, or their perspective. Interviewer: Is there anything else you want to add? Client: In seven words, my grief counselor made all the difference! She gave us the reason to live. I was on a path to destruction, but she helped me in so many ways. I could talk on this for hours. I can’t thank my counselor enough and how this experience turned my life around. There is nothing I can do to thank you enough to this day I can carry on, laugh, and not worry about my son anymore. He will always be in my heart and mind, but you have to live on. Client: After a 15 year battle with breast cancer, my wife passed away. 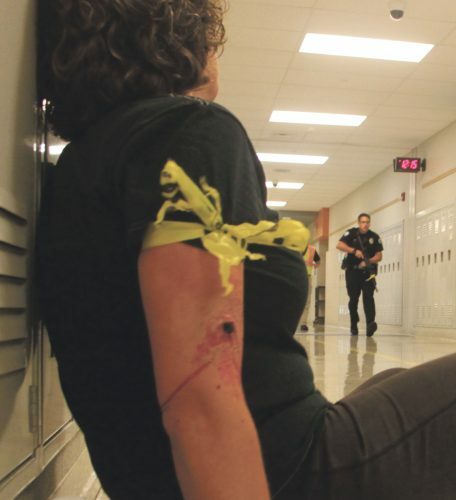 The last year was a long and very difficult year of seeking trial testing in Pittsburgh as a last resort. The last 6 months or so of her life, she was treated simply to keep her comfortable. In the last two months or so of her life, I had Hospice of Warren County nurses come into our home and finally, we made the transition to the John and Orpha Blair Hospice Residence where my children and I stayed with my wife the last 3 weeks of her life. The first week she gained some strength, but then was nonresponsive for 12 days. When the Memorial Service was over, the children and their spouses returned to their homes in Kentucky and I was alone at home. I knew from being a counselor myself that I needed help to process my grief, so within 2 weeks I called The Schorman Center and made my first counseling appointment. I left town shortly thereafter, but upon my return 6 weeks later, I had my first session. Client: At first it felt a bit odd. Here I was sharing my grief with a complete stranger, but she was great. She sat and listened (she told me that I talked more than any man she had ever met) and in a short time, we developed a very easy rapport. She was sympathetic but also challenged me in areas of my thinking that really needed challenged. For me, that was how I grew through my grief in order to heal and move on – both back into full-time ministry, and eventually to meeting my current wife, Elizabeth who is a blessing from God in more ways than I could have dreamed. The Schorman Center counselor helped me move on to a whole life that I never dreamed possible that God had for me. Client: At first it may seem odd, but I believe that is completely normal and necessary for anyone dealing with grief, to process that grief with another person to truly get to the bottom of that grief. Through talking with my grief counselor, friends, family, and my faith in God, I was able to move on to live a new life in ways I never dreamed possible. Everyone needs someone to lean on or to talk to in order for them to move through their grief. Grieving is a normal natural process that needs to occur. It’s when people stymie that process that they have issues later on. Having someone to talk to who is a professional, can also ease some of the burdens on family and friends who may feel anxious about caring for someone going through grief without really knowing how to do that. It allows family and friends the freedom to be just that – family and friends without having to have all the answers that are often difficult to find during those times. Client: At first I talked with my grief counselor every other week. I could just about make it that long before a lot of anxiety and fears and other thoughts would threaten to hamstring me. Over time as I found healing, I was able to spread out the times to I would see her once a month and then toward the end, just checking in every once in a while. She let me find the rhythm of the right amount of time that worked for me. Client: I would just strongly encourage everyone who is processing grief to take advantage of the wonderful counselors The Schorman Center has to offer. It is not a sign of weakness to admit that you need help, by seeking out grief counseling. It is quite the opposite – seeking help requires the strength to admit that you can’t do it on your own – that you need help. If it weren’t for my grief counselor, I’m not sure I would have made it through those early days of grief. Her work with me helped me heal and prepared me to meet my wife, Elizabeth – a true blessing from God. Elizabeth’s love has contributed to my healing in ways I can’t describe. My grief counselor helped me to be able to receive the love that God had planned and was waiting for me. That may not be God’s plan for every person who has lost a spouse, but for me, His gift of Elizabeth was a wonderful confirmation for me that He knew me, loved me, and wanted to bless me so that I could bless others. The Schorman Center services are available to anyone in Warren County, regardless of whether or not they have received care from Hospice of Warren County. If you or someone you know would like further information about The Schorman Center, A Place For Healing Grief and Loss, please call (814) 723-8060, or visit schormancenter.org.